Makari Clear Acnyl Sulfur Soap aims to gently detoxify your skin and prevent excess oil production thereby helping you deal with acne, pimples, and spots and working to minimise the chances of future breakouts. The gentle yet powerful soap bar aims to reduce irritations and regulate oil production in skin. Sulfur acts as an anti-inflammatory to minimize the chances of future breakouts. This clear acnyl sulfur soap is most suited for those with acne prone skin. Clear Acnyl Sulfur Soap is a deep pore cleanser which aims to help reduce the appearance of acne and spots on the surface of the skin and also aims to reduce oil production, thus, preventing future breakouts of acne, pimples and spots. 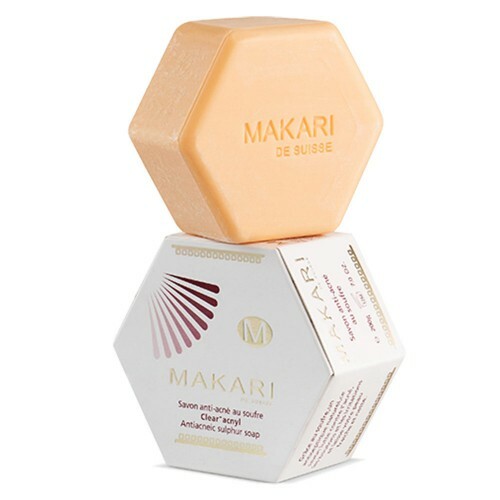 What is Makari Clear Acnyl Sulfur Soap? Makari’s Clear Acnyl Sulfur Soap is a fragrance-filled soap bar which can not only help minimize the irritation caused by spots, acne, pimples but also detoxifies by removing impurities while deeply cleansing pores and controlling oil production levels. With this, you can work towards achieving smooth, spotless skin that can help boost your confidence levels. How does the Clear Acnyl Sulfur Soap work? The natural ingredients in the Clear Acnyl Sulfur Soap works to give you a healthy skin tone and complexion. Sulfur acts as an anti-inflammatory agent that works to reduce irritation and reduce acne and pimples. Other ingredients target detoxification of deep pores, thus removing impurities, and helping you gain a flawless skin. How is Clear Acnyl Sulfur Soap used? Makari’s Clear Acnyl Sulfur Soap simply needs to be applied to the affected areas once a day. This easy-to-use Clear Acnyl Sulfur Soap can help you get rid of acne prone skin with this simple application process. When will results start to show? 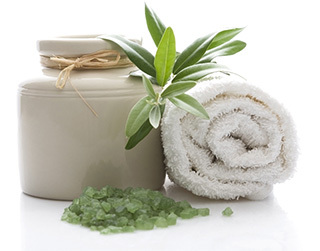 As with any natural skincare product, results will take time to show and will also vary with each individual user. But many users have seen visible results in their skin in a matter of few weeks after using Makari’s Clear Acnyl Sulfur Soap. For best results, it is advised to use the soap daily. Clear Acnyl Sulfur Soap consists of Water, Fragrance, Sodium Chloride, Glycerin, Tetrasodium EDTA, Tetrasodium Etidronate, Precipitated Sulphur, Sodium Hydroxide, Citric Acid, Sodium Palmate and Sodium Kernelate. Clear Acnyl Sulfur Soap is made up of natural ingredients; hence, no unwanted side-effects may be experienced. But, it is always advised that you check the ingredients for allergic reactions, before using the product. You may perform a patch test on the back of your hand and leave it on for 24 hours to check for allergens. If it causes irritation or redness, discontinue use of the product. Do not let the product come in contact with your eyes or mouth. How do I order for my Clear Acnyl Sulfur Soap? It takes only a few moments to order for your Clear Acnyl Sulfur Soap from Skin Care Total. Place an order before 4pm on any working day and get your package delivered by the next day.